The artist/hacker Marcell Mars agues that the concept of the public library is right up there with public education, public health care and the scientific method as a both a great achievement and social good to which almost everybody subscribes to as a non-negotiable public good. Taking the concept of the public library as a benchmark against which to measure what society and culture should be like and an indication that an economy of contribution is possible. Where there is a will there is a way. Mars’s project has taken this broad consensus as the basis for Public Library and on-line book sharing project which promulgates the utopian hacker ethic of the universal space of free ex-change of all knowledge by seeking to fuse a number of existing internet based projects for either managing or exchanging electronic publications (such as Calibre) along with his own plug ins to create a peer 2 peer culture for the exchange of books. To make a place where all people can get access to all knowledge that can be collected. 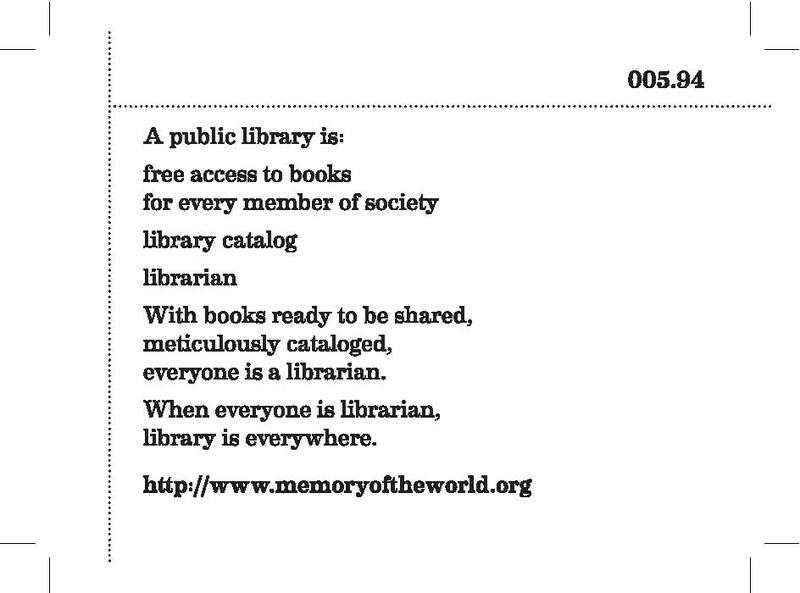 Public Library makes the case for the institution of public library and its principle of universal access to knowledge. It is an exploration and development of distributed in-ternet infrastructure for amateur librarians.